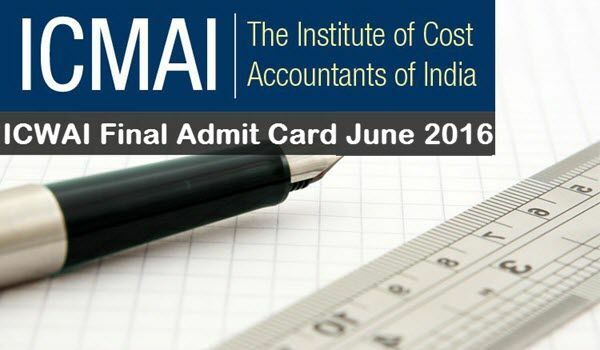 ICWAI (CMA) Final Admit Card June 2016: The Institute of Cost Accountants of India conducts ICWAI Final exams twice in a year in the months of June and December. Recently the institute has released a notification regarding time table / exam dates of ICWAI Final for June 2016 attempt. CMA Final exams June 2016 will be conducted from 11th June 2016 to 18th June 2016. The admit cards will be available on the official website examicmai.org. In general the institute of cost accountants of India releases, CMA Final Admit Card / Hall Ticket for June 2016, just before 21 days of exams. So ICWAI admit card June 2016 will be available from 31st May 2016. Check out the below article to download the ICWAI (CMA) Final Admit Cards for June 2016 examinations. Since the Dec 2013 examinations, ICWAI Final Admit Card is released online at the official website icmai.in. Hard copy of admit card is not sent by post. Current registration number of the candidate will be required to check status and print admit card of ICWAI (ICMAI) Final Admit Card 2016. The student login page at examicmai.org will ask you to enter these details to download the hall ticket. Admit Card of June 2016 is available on the Official Website of the Institute only, and student can download the same. Click below links to download ICWAI Final admit card June 2016. Now you can Enter Your Identification No (SF2013012345) 12 digit format. After Download Admit Card Please Check your All Details like Your Name, Center Address, Subjects, and your Photo etc. Stay tuned to this website for more details regarding ICWAI (CMA) Final June 2016 Results, Toppers, Pass Percentage etc. Hope you like this ICWAI Final Admit Cards / Hall Tickets June 2016 Download. If you like this please share it to your friends who are eagerly waiting to download the CMA Final June 2016 Hall Tickets. Sultan Hindi Movie Trailer Watch & Free Download Youtube 3gp, MP4. Star Parivaar Awards 2016 Full Show, Nominations & Winners List.